Today I decided to do the featured stamper challenge over on SCS. 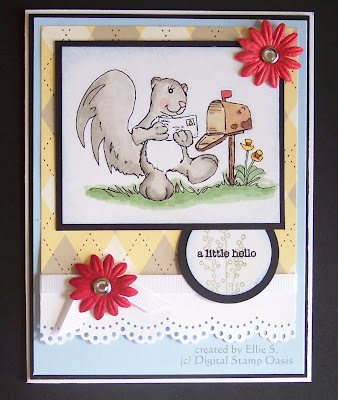 Wattle is the featured Stamper, be sure to check out her gallery, she has some beautiful cards! I chose to CASE this card. While I don't have the same image, I thought this cute Susie Squirrel image would be a perfect substitute. I kept the same color scheme and also the same sketch. I did add another black layer and also added prima flowers. Image was colored with copics. Thanks so much for visiting my blog today, be sure to check out the Digital Tuesday challenge if you like to use digital stamps - the theme is Earth day, and it is a color challenge. Ellie, super cute card. I love the image and the colors you used. Gorgeous and so cute. Loving the papers.